Some people don’t think deep enough. “I don’t know. Everything is pretty good.” Not to be a pessimist, but I doubt it. I doubt everything is good, and if everything would happen to be good, not everything is great. There is room for a topic to coach around. Some people think too deep. “I am so busy that if there is a way to invest more time, I don’t want to know. Everything might fall apart if I jiggle it around too much.” If you are too busy to be coached, you are too busy not to be coached. Coaching the appropriate area can only help. Some people are too guarded. “Everything is moving pretty well right now. No major problems.” Coaching is confidential for a reason. We aren’t looking for whiners but there is an appropriate place to share your inner concerns and find some ways to boost up your confidence. 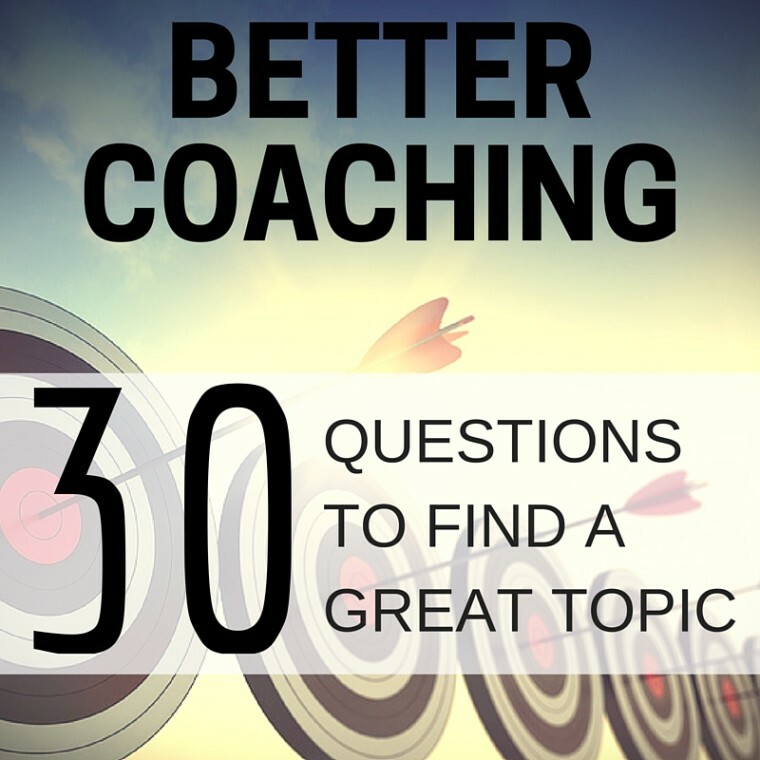 I’ve written up 30+ questions that the client should ask herself before the session to help her find a coaching topic. These questions could be asked at the beginning of the session, but I designed the questions to be a broad assessment that would bubble a topic to the top of their consciousness before the session begins. I have several new clients this year so I’m going to send them this list of questions to help them generate topics and give them an idea of what topics might be appropriate to coaching. When I’m ready to coach them, I might ask, “What do you want to talk about today?” If they aren’t sure, I might ask, “What question stuck out to you in the list I sent?” I wouldn’t hold them to a topic generated from this list. What are a few things that you’d really like to talk through? What are the next few steps you need to take where you have little motivation to take action? Where is a place you want to go in your life or career but aren’t sure the steps to get there? What is a deadline that is set that would benefit from a well thought out plan? Where are you losing the most time right now that you’d like to get back? What are some frustrating obstacles in your life right now? Where do you want to be at the end of 1 year, 5 years, 10 years? What is a relationship that you have that is suffering? What is a relationship that is causing you to suffer? What is your most/least productive time of day? How would you rate your physical fitness? Spiritual fitness? Emotional fitness? What skills are you missing to move into a role you’d love to have? What strengths do you have that are underused? Where are you operating out of a weakness? How clear is your vision for the future? Do you have time off planned? Do you know how to get what you need out of those days? What one thing should you be doing for yourself that you have been neglecting? What in your life would benefit from some better organization? What is something in your life that has felt stuck? What does the perfect day look like for you? What needs to change in order to have that day every day? What is the next major financial decision you need to make? What do you want to do but just don’t have the confidence to do? What are you thinking about as you fall asleep? What is the first thing on your mind (outside of getting ready) when you wake up? What is one thing you wish a close friend knew? What would change if you overcome your greatest fear? What is a system in your life or work that needs created or reworked? Who is your hero and how could you become more like them? We both had a laugh for a moment and then it quickly became serious when he began to share some fears he could not seem so shake that were were keeping him up at nigh. His nest statement was ” I cant stop thinking about…”I think it comes down to the relationship really. I am not suggesting using this approach, however a question tied to the daily activities seems to be an effective tool for me when everything is great. Thank you, Brian, for this blog! What fabulous questions that can help us in coaching clients who have no clue where to start.